Let's make one thing clear immediately: Peyton Manning and the Denver Broncos are not "frauds," as some in the mainstream media are eagerly proclaiming after their loss at Foxboro. Many are citing Manning's record in sub-freezing temperatures as proof of the Broncos' playoff fallibility, but multiple writers have already dispelled that notion. Manning is most certainly not the problem in Denver, and fortunately most rational fans do not need much explanation to understand that. 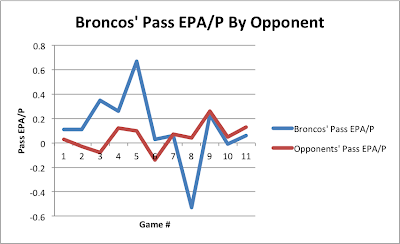 However, many fans might have come away believing that the Broncos' pass defense is the team's Achilles heel. Indeed, it was not some inherent cold-weather flaw in Manning that cost Denver the game, but rather a second half in which Tom Brady and the Patriots moved the ball at will. At the beginning of the year, Denver's pass defense results were strongly correlated with their competition, making them vulnerable to great passing teams. 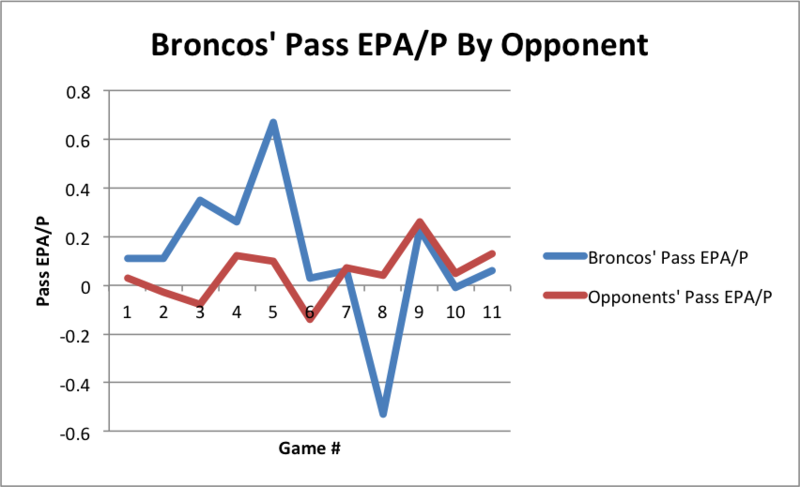 However, in recent weeks, the Broncos have bucked that trend (sorry, I had to) and actually performed better than average against their opponents. Denver's personnel trends seem to support this hypothesis as well. Despite modest sack totals, Von Miller has actually been a behemoth since his return, with the second-highest EPA/G among linebackers. Shaun Phillips has compiled 10 sacks as the Broncos' other pass-rushing star. In the secondary, Dominique Rodgers-Cromartie, Kayvon Webster and Chris Harris gave Denver three good corners when Webster started seeing more snaps after the first month. 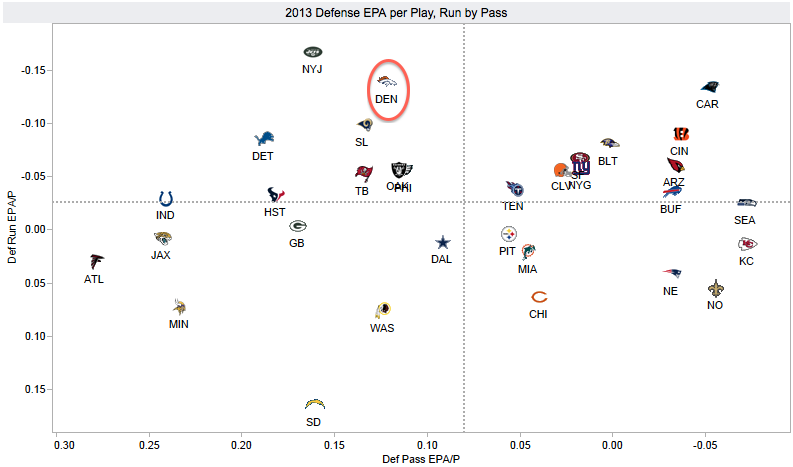 If there's cause for concern, it's that Denver is not particularly deep in the secondary, as the New England loss exposed. Rodgers-Cromartie's shoulder injury, suffered while needlessly diving for a Hail Mary, forced the Broncos to stray from their man concepts and play soft zone, a death knell against Brady. Starting safety Duke Ihenacho was also in and out of the game after halftime. Champ Bailey has essentially missed the whole season, and his imminent return should bolster that depth. It's always dangerous to rely on a 35-year old corner staying healthy while playing heavy snaps. But Bailey still graded out as the 10th best corner in the league last season, per Pro Football Focus, so any contributions should be a positive addition to an improving unit. Denver's ceiling may be a slightly above average pass defense, and they're a couple injuries away from being a disaster. But average is good enough when paired with that offense. Most people believe the NFC East is the worst division in the league, but the NFC North certainly challenges that notion. Granted, part of that is due to the Aaron Rodgers-less Packers turning into Jaguars North. Still, the average ranking of the four North teams is 15.0, while the East sits not far behind at 15.1. Just sayin'. The Lions looked like potential first-round bye challengers after improving to 6-3, but two consecutive losses to the Steelers and Buccaneers bore strong resemblances to past bumbling Detroit teams. The Lions defense, which has excelled against the run this year, has given up nine pass plays of 20 or more yards the past two weeks after conceding 29 such plays through the first nine games. 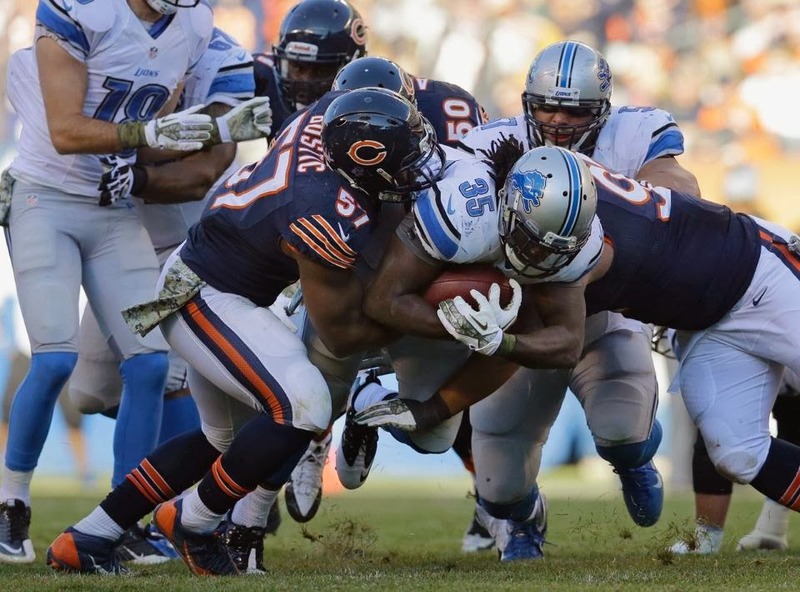 But Chicago would gladly take the Lions defense, as the Bears defense has turned into one of the league's worst units. While we're on the subject of giving up big plays, the Bears have given up 6.0 yards per play, 28th in the league. Injuries and age have worn down this once-proud unit, with Henry Melton out for the season, Charles Tillman and Lance Briggs missing significant time, and Julius Peppers turning into a pumpkin. Chicago is extremely fortunate that Josh McCown has played so well in Jay Cutler's stead, otherwise the Bears would already be out of the division title hunt. And before you attribute Green Bay's problems solely to Rodgers' absence, note that their defense is below average against both the pass and the run. Apart from Clay Matthews and Tramon Williams, the Packers defense does not have any particularly impactful players, as no one else is even in the top-40 of EPA/G at their position. The massive downgrade at quarterback obviously hurts, but the Packers really don't have enough to stay afloat without their former MVP. The collective mediocrity has kept everyone besides Minnesota in the race. These three teams do have excellent passing games (when Rodgers comes back), which is certainly enough to at least be competitive. But the NFC fourth-seed, who will likely be a home underdog against Carolina in the Wild Card round, might come from the North instead of the East after all. - Since we're on the subject of pass defense today, Washington's fall out of the playoffs this season will largely fall on their regression in that facet. 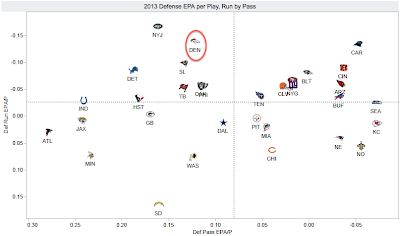 Washington ranks 26th in EPA per play there, en route to the league's least efficient pass defense. D.C. was only 21st in 2012, but they jumped into the top third of the league in terms of passing yards allowed per play during their season-ending seven-game winning streak, per Pro-Football-Reference. Robert Griffin III's diminished production following his knee injury certainly hurts, but it's not the deciding factor in the team's decline. - Curious to see the 5-6 St. Louis Rams ranked 30th. The Rams are a strange team, having gone on two separate three-game losing streaks. And yet, their average margin of victory this year has been a whopping 18.6 points per game. For reference, the Broncos have won by an average of 16.6 points per game this year. St. Louis is a young and talented team, and if they find a stable quarterback solution, they might start to turn in some more consistently positive (and sensible) results. - The AFC sixth-seed contender field hurts my head. We have the whole range of teams, from the all-offense-no-defense Chargers to the middle ground Titans and the defensively oriented Browns. Mostly, there are a bunch of teams (nine, to be precise) who are within one game of each other and are average or worse at both offense and defense. Woo-hoo. You really have to squint to see anything that suggests one team is particularly better than the rest. The Steelers and Ravens have recent history, I suppose, and I'll likely do a write-up on whoever wins that game in next week's rankings (which probably means they'll tie). But the whole bunch just looks like one indistinguishable morass of mediocrity. Now that I've thoroughly depressed you with thoughts of Geno Smith's turnover rate and Ray Rice's yards per carry, check out the rankings for some cheerier sights. Surely the AFC South is the worst division in the league, and it isn't close? Disagree, just like the P Manning playoff myth article, you use the information wrong. Information by itself has no value, proper use of it gives it value. When surprise teams like the 2011 Giants win the SB, well of coarse they will have weaknesses in the regular season, if they did not they would not be surprise teams. The Giants finished 9-7 while getting out-scored on the year. It should go without saying that of coarse such a team will not be statisticall strong in all areas, if they were they would not end at 9-7 and get out-scored on the year. Therefore using the 2011 Gaints is a very bad example. T o use the 2011 Gaints properly one must look at what their pass defense did in the playoffs to cause them to win the SB. A Rodgers set the NFL record with a 122.6 QB Passer Rating that season, all the Giants pass defense did was hold him to a 78.5, that'd be 44.1 below is regular season record for those keeping score at home. They held M Ryan to a 71.9, or 19.2 below his regular season. Brady to 91.1, or 14.5 below. They did crash and burn VS Smith in the NFC Championship game in a game they were lucky to win with Smith getting 97.6, or 6.9 above. A much better, more accurate way would be to look at teams amoungst the favorites who happen to have a strong regular season like for example the 2009 Saints or 2008 Steelers and then get back with how strong those pass defenses were. As you alluded, it's not that Denver isn't deep in the secondary, it's that no defense is deep in the secondary once it's lost both of its starting CBs (Champ and DRC) and both of its starting safeties (Moore and, at times, Ihenacho). to look solely at the playoff games of SB winning teams like I did at the community site some two yrs ago: Pass D (& to a certain point Run D) indeed is the 2nd most important factor after Pass O to prevail in the end. And, of course, PM only won the SB when the Colts D excelled their RS performance immensely. In my comments at the "Brady/PM article" & "PM playoff myth article" I gave countless numbers and explanations that indeed PM is underperforming (to say the least) in pressure games/playoff games and that his awful sunday night game vs NE indeed was the biggest reason they lost. But as it always is, PM is credited for the wins, but everybody else & circumstances for his meltdowns. Funny thing is that mainstream & stat sites agree on him, but are (rightfully) miles apart anywhere else. I have one question about the data table at the end, and one about the rankings. 1a. How are you calculating the league averages? Since those stats are all per play stats, I could see taking the league-wide per play averages. But since teams want to compare themselves to other teams, maybe team-weighted averaging might make sense? 1b. Shouldn't the league-average defense stats match the league-average offense stats exactly? I guess this might be an artifact of calculating the averages using team-weighting rather than play-weighting. 2. Looking at NO and SEA, t's interesting how a two-position advantage on offense more than offsets a 10-position deficit on defense to give a small GWP advantage to New Orleans. I know at least part of that is that there is more variation among offensive skill than among defensive skill, as Brian has shown in the past. But it would be interesting to see a quantification of how much distance there is between each rank on those measures. The big games this week the model has Seattle -2.5 and Denver -6. Look at it this way, NE has a .59 GWP to Houston .44 a .15 advantage. Bengals have a .65 to SD .51 a .14 advantage. The advantage is almost equal, but NE is favored by 7.5 while the Bengals are getting +1, that'd be a 8.5 difference in the spread on games with an equal advantage. Somethings got to give, either the model is way off or the lines are way off. The last Denver/KC game was not a good situation for KC, siiting at 9-0 they became the hunted instead of being the hunter. This week after dropping 2 straight KC becomes the hunter. KC should be right there at the end for the win. The line should be closer to PK then -6. This may not be the best place for this, but Brian can you add adjusted advanced team stats to the site like you have the adjusted success rate? Also, a forums would be nice if possible.